I received an offer my meager budget and wandering nature would not allow me to refuse: A 664-mile round-trip on the Greyhound bus from San Diego to Las Vegas for $62.50. Even if I had to pay for a post-bus ride tetanus shot and sputum culture on account of Greyhound’s supposed dreadful conditions, the ticket was still just half the cost of driving. Plus I’d have eight hours of nothingness each way, which was almost unheard of in the two years since I went on an unexpected reproductive binge that resulted in two off-the-chain baby boys in just over 18 months. To the Hound I went. San Diego’s main Greyhound station is a small hub located in what may be the last part of its downtown that has yet to realize the aesthetic benefits of gentrification. The four or so block area, full of the forgotten and ignored and just plain deranged, is a Skid Row-esque blemish on America’s Finest City. The homeless here don’t ask for money or food but seem to wander in an outdoor asylum. I got to the terminal — consisting of little more than a small building for employees and outdoor seats blocked by a mini-gate for passengers — and felt like I entered heaven. 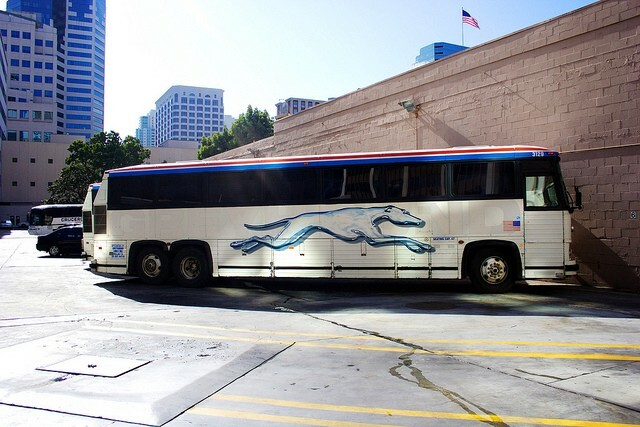 I figured this was part of Greyhound’s marketing plan. Put the stations in slums so when passengers board the buses they’ll immediately feel like they’ve moved on up to the Eastside. As I moved in line to board the bus, the driver, who was pulling double duty as ticket-checker, yelled, “Take your tickets out the envelope!” About a quarter of the people failed to follow her directions and with each deviant the driver became more upset. A sigh and a, “Please take your ticket out the envelope” eventually became a near mouth-to-ear scream of, “What don’t you understand about taking your ticket out the envelope?” If I wasn’t trying so hard not to laugh out loud I would have been appalled. The ride to Vegas was actually not too bad. The bus was new and clean and had comfortable pleather seats. The obligatory awkward conversation with fellow passengers was avoided as no one sat next to me, unless you count the mildewed blanket wrapped tightly with twine that some guy placed near me after boarding halfway through the trip. The numerous stops, which I thought would bug the hell out of me, allowed for an interesting look at various locations in the gooch of Southern California. One of them being Popeyes, whose spicy fried chicken further negated any impatience I had with the delays. After eight hours of sleeping and reading, I arrived in Downtown Las Vegas. I continued with my budget ways and took the city bus to The Strip to find my hotel. A Greyhound security guard directed me to The Deuce, a double-decker bus that goes up and down The Strip. After walking around lost for about an hour in 100-odd degree weather, mostly due to my terrible sense of direction and the guard’s insistence on using foreign words like “north” and “south” as opposed to “left” and “right,” I finally found a bus stop. The Deuce, which you’d think would cost two bucks, was actually six dollars for a one-way ride or eight dollars for a 24-hour pass. It stopped at nearly every hotel and accounting for traffic, lack of bus lanes, and the tens of people getting off and on, traveled at about five miles per hour. It was the most disappointing form of transportation since the electronic vow of celibacy known as the Segway. I actually got off it three stops before my hotel and managed to beat the bus walking. Of course, my T-shirt was soaked with desert funk, but I still won. I spent the next few hours in Vegas wandering aimlessly around the Strip. The question “Why am I here?” popped in my head more than once and I concluded that it was mainly for the benefit of my kids. I stay at home with them five days a week and if I don’t make time for me and my drunken inner voice, there is no way I can continue to be the great father who occupies them with Netflix for hours on end. Plus, my brother’s friends were in town. They were balling out in a suite in the new and luxurious Aria Resort and would be glad to see a familiar face come by and drink their liquor. I did exactly that and also went to nightclub where I paid $14 for a Jack and Coke, which in Greyhound bucks is worth about 145 miles. Never again. After less than 24 hours in Sin City, I awakened around 10 a.m. to catch the noon bus back to San Diego. My total trip expenses were less than $200, so I splurged on a cab ride to the Greyhound station. I grabbed a taxi outside of my hotel and comfortably cruised for about 30 seconds until the driver said, “It cost $45.” I mentioned that the price seemed steep for such a short ride. He responded, “What do you pay?” I had never bartered with a cab driver, but in years past I had given friends gas money (or at least said I would) and $20 was always more than enough to repay their kindness, and in this case it seemed like a good first offer. The driver responded by cursing under his breath. He then drove in reverse from the hotel street exit back to the lobby entrance, slammed on his brakes and mentioned something that I could do to myself. His snide suggestion actually sounded like a lot of fun, but I had already taken care of that twice over before leaving the hotel and needed to focus my energy elsewhere. I thanked him and started walking to the bus station. I walked to the customer service area and waited behind three young women who were also unable to board the bus. We struck a conversation and found common ground as four pissed off people on a budget. After a 15-minute wait, we were finally able to talk to the pair of Greyhound reps working the desk. They explained that the next bus to Los Angeles would arrive in about two hours. However, we would not be able to board this bus because it was also sold out. So our only option was to get the 7:40 p.m. bus, which would get me to San Diego at about 3 a.m. Apparently Greyhound has a strange policy that is not explained when you purchase a ticket: A ticket is not really a ticket for a bus ride. It is simply an opportunity to participate in a race to get on a bus. The three women huddled to figure out what to do next. I lurked nearby listening to their discussion, hoping they understood that we had strength in numbers and how that increased our likelihood of getting back to Southern California in a timely and affordable fashion. But with three people they already had numbers. They could easily dismiss me as a lonely creeper, which was partly true, and figure out their own way home without me. Lucky for me, they asked if I wanted to split the cost of a one-way rental car. Of course I did. After six hours of driving and an equally long conversation about men and the esoteric games we play with women, we arrived in their home of Long Beach. Two hours later, I was in San Diego having far surpassed my budget by spending $249.50 in transportation costs alone. This included a second cab from the Greyhound station to the airport — $20 apiece — and the car we rented for $60 each. Greyhound refused to refund the unused portion of my ticket.